A gailey is a teep o ship propelled bi rowers that oreeginatit in the eastren Mediterranean Sea an wis uised for warfare, trade an piracy frae the first millennium BC. Gaileys dominatit naval warfare in the Mediterranean frae the 8t century BC till development o advanced sailin warships in the 17t century. Gaileys foucht in the wars o Assirie, auncient Phoenicie, Greece, Carthage an Roum till the 4t century AD. Efter the faw o the Wastren Roman Empire gaileys furmed the mainstay o the Byzantine navy an ither navies o successors o the Roman Empire, as well as new Muslim navies. 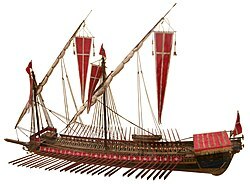 Medieval Mediterranean states, notably the Italian maritime republics, includin Venice, Pisa, Genoa an the Ottoman Empire relied on them as the primary warships o thair fleets till the 17t century, whan thay wis gradually replaced bi sailin warships. gaileys continued tae be applee'd in minor roles in the Mediterranean an the Baltic Sea even efter the introduction o steam propelled ships in the early 19t century. The gailey engagements at Actium an Lepanto is amang the greatest naval battles in history. This page wis last eeditit on 4 Apryle 2017, at 02:26.